This classic Mexican snack food (think a more sophisticated version of the cheese sandwich) is full of flavours and textures — from the smoothness of the avocado to the piquancy of the red pepper and the salty sweetness of the Gruyère. 1. Seed and thinly slice the peppers, then heat a little oil in a large frying pan and gently cook them for 10 minutes until softened. 2. Skin, stone and dice the avocados, and scatter onto 4 of the wraps. Then using a fork, mash the avocado roughly onto the flatbread. Spoon over the peppers and sprinkle with cheese. Sandwich a second wrap on top of each. 3. Wipe out the pan with kitchen paper and cook each quesadilla for 3–4 minutes on each side until crisp and golden, and the cheese within has melted. 4. Meanwhile, stir together the tomatoes, red onion, chilli, coriander, lime juice and a splash of olive oil. 5. 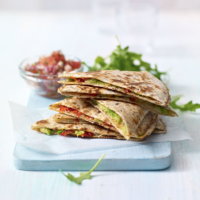 Cut each quesadilla into 6 equal portions, and serve with the salsa and a scattering of rocket leaves. This recipe was first published in Wed Jun 10 14:21:00 BST 2015.